Foreclosures Archives - Page 2 of 5 - Neighbors at War! We’re Back! Wobbley, But Back! 1 Comment on We’re Back! Wobbley, But Back! My Webmaster is my personal hero/heroine. By some miracle she has restored most or all of my blog posts that were trashed in this most recent hack attack. Although my posts might not be in chronological order, that’s OK. It may actually mean that you get to read some things you otherwise might have missed because they were written some time ago. In the meantime, if you ever need a genious as your own personal Webmaster, please let me know. I kind of hate to refer her to you because I don’t want to ever lose someone with her Internet talent and knowledge. 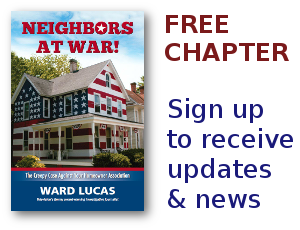 But if you email me at Ward@NeighborsAtWar.com, I will (reluctantly) give her your name and contact number. 5 Comments on What First Amendment? I’ve gotten some emails from Maryland asking the impact of the proposed state proposal to change the status of the Columbia Association (an HOA) into a ‘newly created’ nonprofit community services corporation, whatever that is. Any help on understanding this issue would be hugely appreciated. A public answer here, or private (NeighborsAtWar@hotmail. com), and I will be eternally grateful.